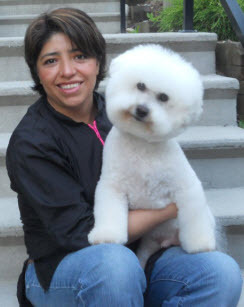 I became a dog groomer because I have a passion – I simply love, love, love dogs! I have groomed just about every breed you could mention, and that experience, combined with the passion I have for dog grooming gives me the confidence to offer you my 100% satisfaction pet grooming guarantee. My clients tell me I am naturally gifted in this field and regardless of how near or far they are, my clients are happy to drive to my Burnaby dog salon from New Westminster, Vancouver, North Vancouver, West Vancouver and beyond for their dog. Give me a call at (778) 918-9178 and I'll be happy to answer your important questions and check my availability for your dogs first grooming appointment. You can read some of my dog groomer reviews here.